Going to the beach . . . in Maine? For first time visitors to Maine it is a bit surprising to see the quizzical looks from locals when they ask where the nearest beach may be found. You see, once you travel north of the southern Maine areas of the Yorks, Wells and Ogunquit, there are very few places with sand beaches. In fact, the rugged and rocky coastline is one of the most attractive things about the Maine coast! 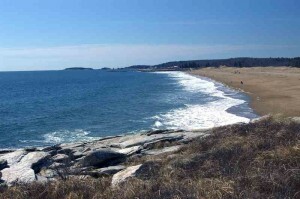 The relative rarity of sand beaches, and the particularly cold temperatures of the Atlantic Ocean in the Gulf of Maine make beach-going and swimming somewhat less common than in warmer climes. However, for those determined to seek out the sand, it certainly can be found. 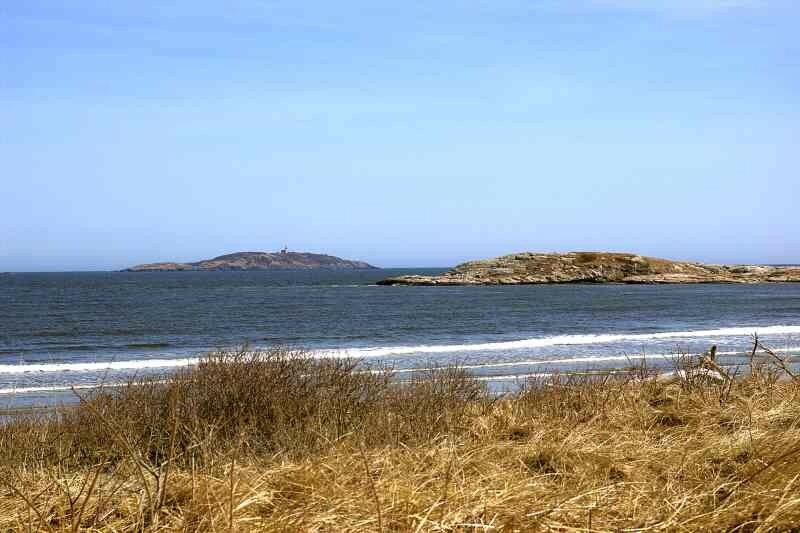 One of the most popular beaches for families, or anyone seeking a broad expanse of sandy beach (just beyond the grasses in the photo), with views of the offshore islands and lighthouses, is Popham Beach State Park. Besides a wonderful beach, hiking trails and the usual State Park amenities, it is not far to Fort Popham, an unfinished Civil War fort, which can be explored. If you’d like to have the best of both worlds, you would have a hard time beating the views at Reid State Park. 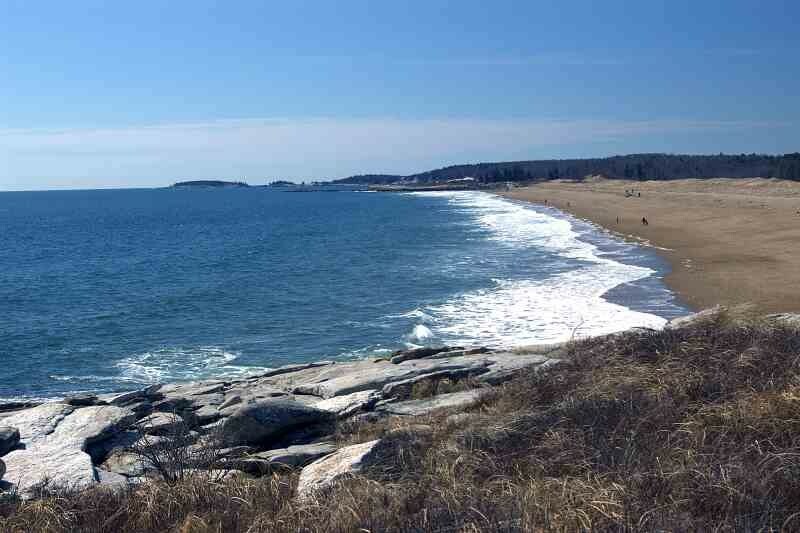 While only about 4 miles from Popham Beach State Park by water, it is more like 27 miles by road, as you must return to Bath, Maine, then cross the Kennebec River, cross the short bridge to Georgetown Island, and drive out near the end of the island to find the park. 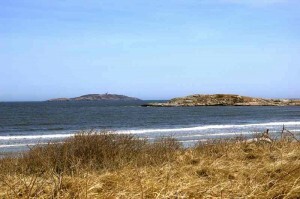 Reid, too, has a wonderful sand beach, but also has the craggy granite boulders that allow you to walk to the top and have a magnificent view of the beach, the islands with their lighthouses, and the mouth of the Sheepscot River. While we can help you find these parks, with their sandy beaches, we can’t take responsibility for the water temperature! It is usually very cold!